“Miya’s Closet” (www.miyascloset.com), a rental shop for Korean traditional clothing Hanbok in Jeju Island, South Korea, announced on November 1 that it now provides various services for tourists visiting Jeju Island with the slogan “Wear Jeju“. Inaddition, it is offering a package program including homestay, driving guide and professional photo service. The shop is located near the Jeju airport, which is easy to access geographically. “Miya’s closet” representative Miya, who has spent 15 years in the fashion industry with major companies in Korea and studied in China, has discovered a harmony between the beauty of Jeju Island’s natural scenery and traditional Korean costume, Hanbok. Unlike the fusion Hanbok with western dress styles offered at some of the rental stores in Seoul, “Miya’s closet” sticks to Hanbok’s originality with a good sense of color and beauty. In addition to the traditional Korean Hanbok made by famous Korean designers, “Miya’s closet” also prepared modern casual Hanbok that reveals the charm of Jeju Island. This modern casual Hanbok is especially well embraced by Korean domestic tourists because it is not only convenient to move, but is also made with the motif of Jeju Island. Nonetheless, a variety of kids Hanbok is available for children traveling to Jeju with their parents. 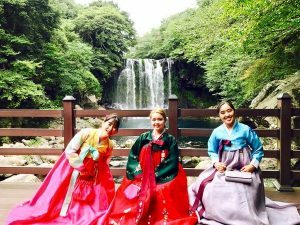 “Miya’s Closet” will be offering a 2-night free overnight stay and a free 1-day Hanbok experience ticket for tourists who are planning for a trip to Jeju Island. Plus, it will give free Hanbok rental tickets and 50% discount coupon for Instagram followers selected by lottery through Instagram (www.instagram.com/_miyascloset_).